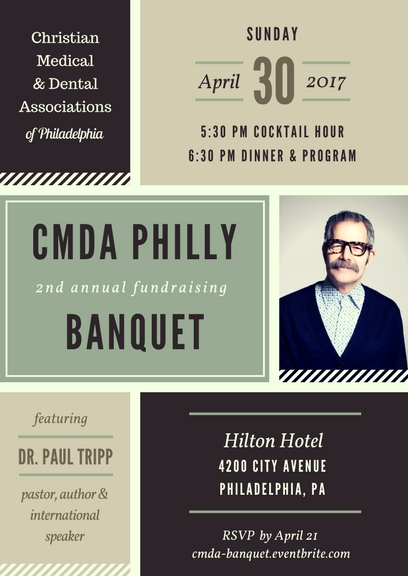 As our 2017 CMDA Philadelphia Banquet with speaker Paul Tripp gets closer, we just want to make sure you know you’re invited. It is a fundraiser for our ministry, but registration is free and we’ve designed the evening to be both refreshing and encouraging for you. You can learn more through the invitation below, and register online right here. Feel free to share and invite others! This entry was posted in announcement and tagged banquet, CMDA, fundraiser, Paul Tripp by Bryan Stoudt. Bookmark the permalink.